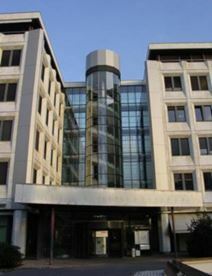 Conveniently located in the dynamic and attractive business district of Lausanne, this stylish building offers a wonderful view over the city and the lake of Geneva. The building provides a full range of facilities and is supported by professional and highly skilled staff offering first-class services and assisting your business in daily tasks. These offices are ideally located close to the airport and the railway station. The building is found right by Lake Geneva, where you will be surrounded by an abundance of local amenities as well as many public transport links. These accommodating offices are offered at affordable rates on a flexible basis, equipped with a charming outdoor terrace with sprawling views of Lausanne. The space comes furnished with a supermarket on the ground floor and a fitness centre on the first. Offices come fully services and beautifully furnished, with an abundance of natural light. The layout of offices is configurable to your desires, whether you wish to make the space suitable for private work or larger project groups. An on-site administration team is on-hand to support you with administrative and secretarial task, so your day goes as smoothly as possible. As a major transport hub, Lausanne enjoys excellent links by rail, metro and bus. Found in an highly convenient and prestigious retail park location, the business centre is only 15 minutes outside of the city of Lausanne. The business centre is surrounded by ample local amenities including eateries, supermarkets and large corporations. The space is modern and contemporary, offering bright work spaces which vary from private offices and coworking options to virtual office solutions. With 24 hour access and a professional on-site management team, everything is taken care of here so you can focus on your working day. This superb modern business centre is set on the shores of Lake Geneva and benefits from an excellent location, easily accessible from the A9 Motorway and public transport. Surrounded by pedestrianized shopping areas and a range of other business amenities, this centre is set in a lively district which has recently undergone complete renewal. At this business centre, you can enjoy 24-hour access and security, secretarial team, IT support and beverages. These offices come furnished for your convenience.